Want to win a tour in Tokyo, Paris, or London? Read on to find out more! 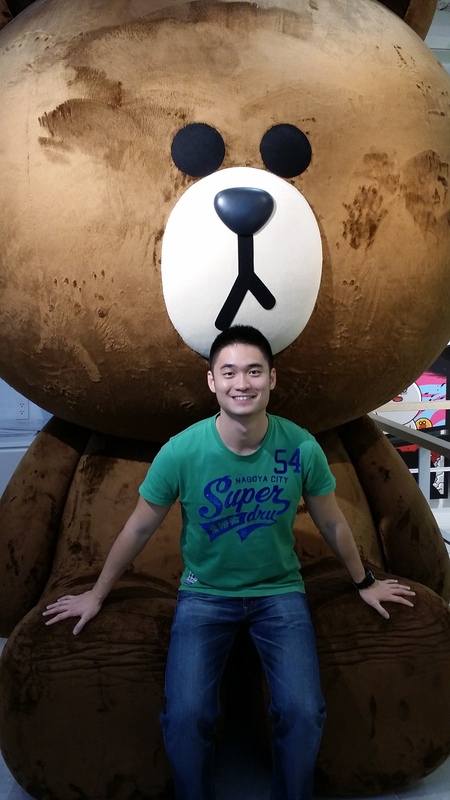 Work and life has been a little busy, but I’m pleased to share my final blog post on my trip to Japan in 2015! I stayed in two different hotels within Ikebukuro (池袋) during my Tokyo leg; I had not explored this part of Tokyo previously and I was pleasantly surprised. Did you know that Ikebukuro Station is the second busiest station, surpassed only by Shinjuku Station. However, unlike it’s more popular counterpart, Ikebukuro is a cheaper location to stay in without missing out on any of the hustle and bustle. Between the B Ikebukuro and APA Hotel Ikebukuro-Eki-Kitaguchi hotels, I very much preferred the former. 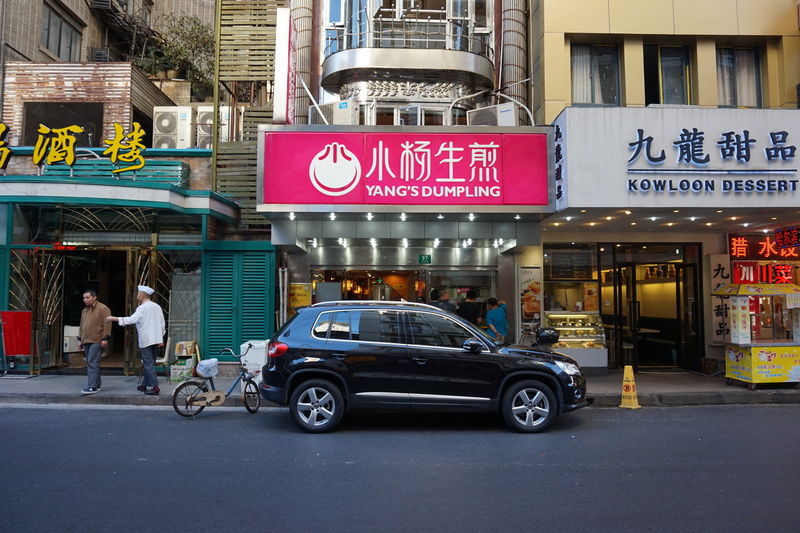 These two hotels were both great choices for under S$150 a night, but the location for the B was much more convenient and in a better neighbourhood. Basically, APA was too close to drinking bars/clubs and the night entertainment area for my comfort, and a bit further away from the train station. 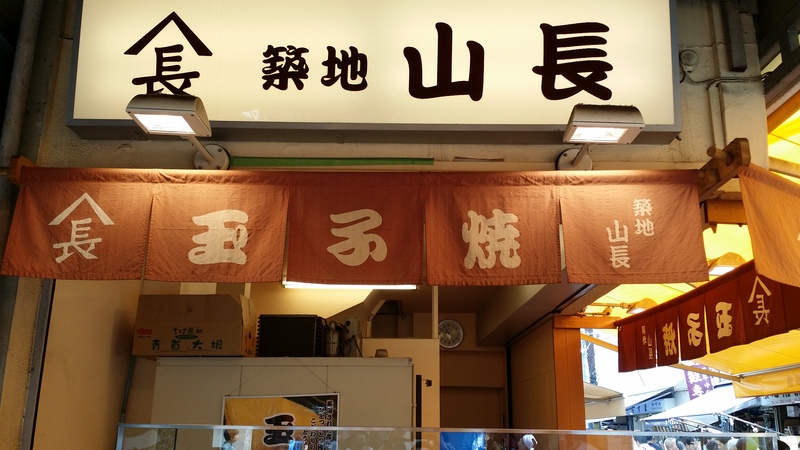 Everyone must have heard about Tsukiji Fish Market (築地市場) closing its operations and relocating in November 2016. It becomes a must-go destination not only to observe the early-morning tuna auction, but also to taste the fresh seafood at the popular stalls there. I had a tiring red-eye flight, so I had to give the auction a miss. Those who want a piece of the action must be prepared to wake up at 3am to queue, as admission is on a first-come-first-serve basis. 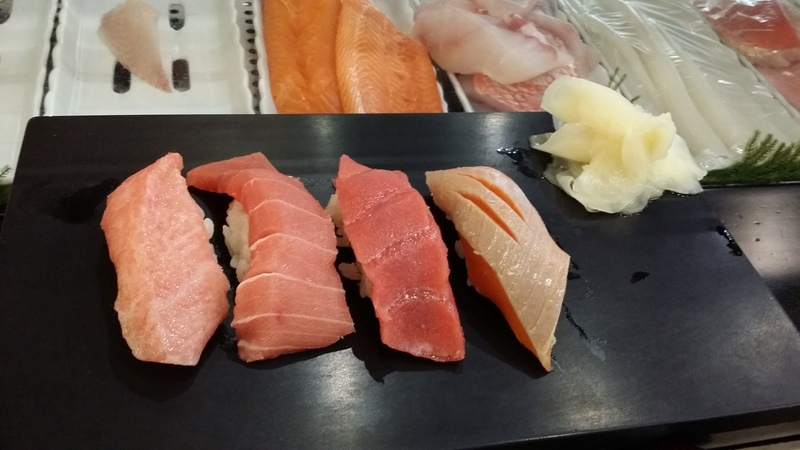 I reached Tsukiji around 10am, and the much raved Sushi Dai (寿司大) or Daiwa Sushi (大和寿司) were not feasible ideas when I’m carrying a luggage straight from the airport. I settled for chain restaurant Sushi Zanmai (すしざんまい) the King of Tuna, which was in fact very decent. Moving on, I wandered the narrow streets of Tsukiji and stumbled upon grilled scallops, tamagoyaki (egg potong stick), ramen and many more. 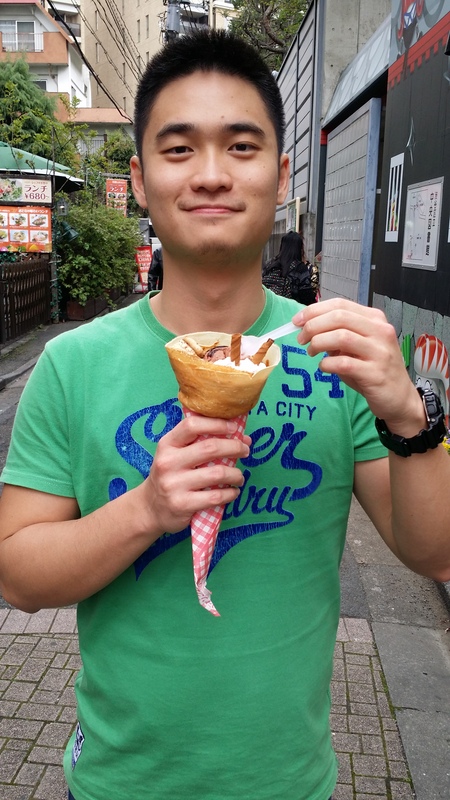 I was full and satisfied within 2 hours of stepping foot in Tokyo. 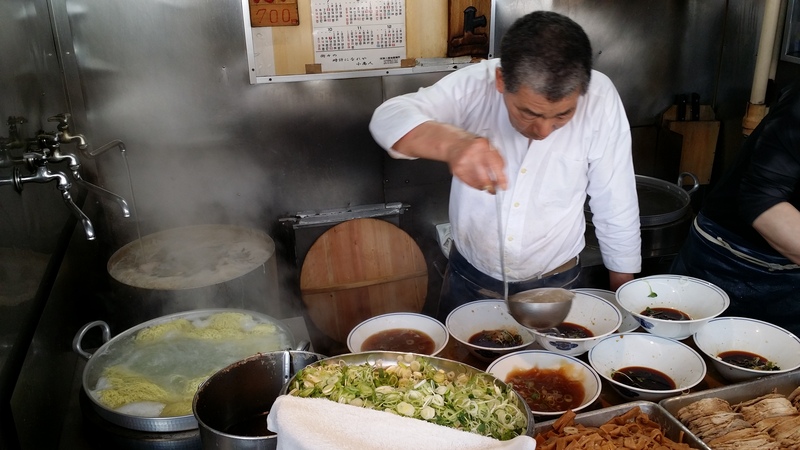 I know it’s rare to hear this, but the ramen chef really prepared the bowls with finesse. They do it 10 bowls per batch, and everything was done so orderly. 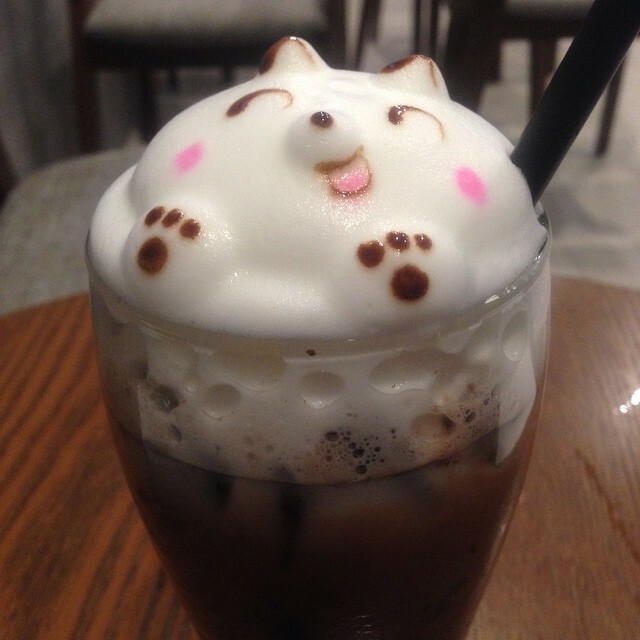 Slurp. Another area I love to visit in Tokyo is Harajuku (原宿) and Omotesando (表参道). It is interesting to stroll through Takeshita Dori while snacking on crepes, but one of the main highlight for me is the LINE store at the end of this street. 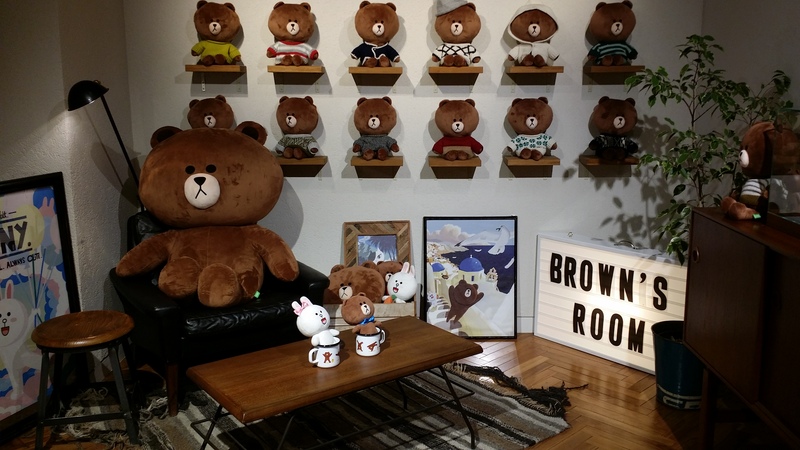 One of only two stores in the whole of Japan (other store is in Sendai), this is the place to stock up on your LINE merchandise. One of my favourite Starbucks in Tokyo is at Tokyu Plaza Omotesando Harajuku, at the road junction not far from the LINE store. It is located on the rooftop and has a large garden terrace for relaxing and coffee chats. Tourists being tourists, I had to make a visit to the Kaminarimon (雷門) Thunder Gate. A short walk from the Asakusa (浅草), you won’t miss this place with hundreds of people thronging the narrow street leading up to the temple. 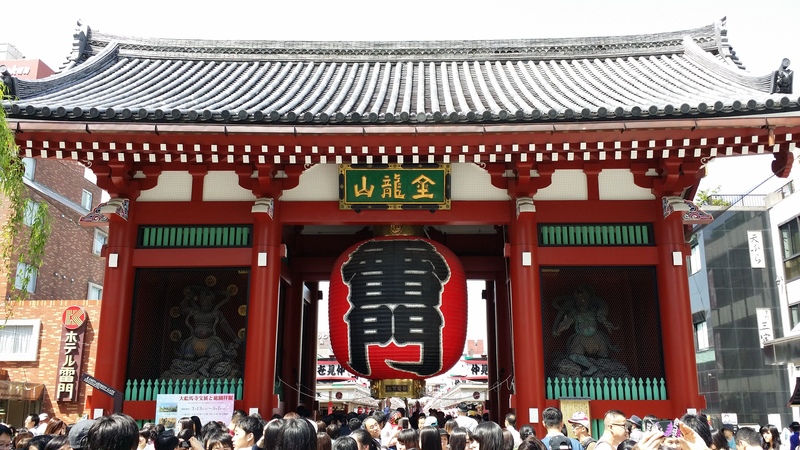 Within the gates lie Tokyo’s oldest and most famous temple – Sensoji (浅草寺). It’s fun to walk around and look at the handicrafts/souvenirs they have for sale, but do note that they (prices) are targeted towards tourists. 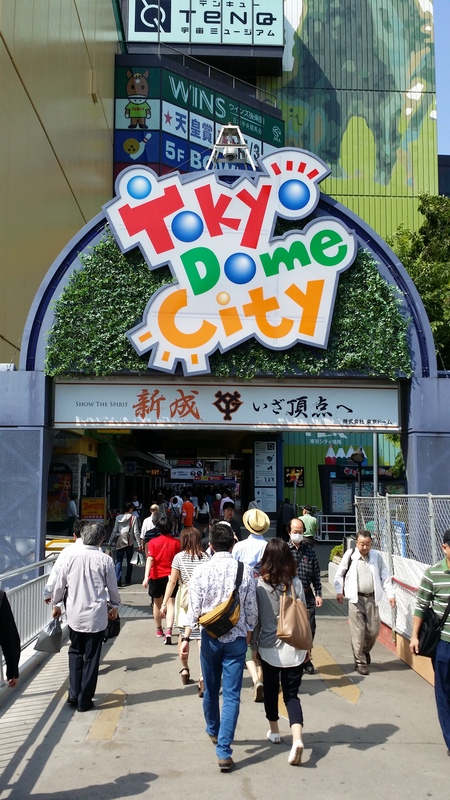 I passed by Tokyo Dome City during the last day of my previous trip, and I so badly wanted to check out this amazing place in Tokyo that has a roller coaster! I specially went there this time, just to sit on the Thunder Dolphin. It costs 1,030 yen per ride, and a roller coaster adrenaline junkie like me didn’t regret it at all. Watch the video below for the first person point of view! Friends who know me well understands that I love ramen. 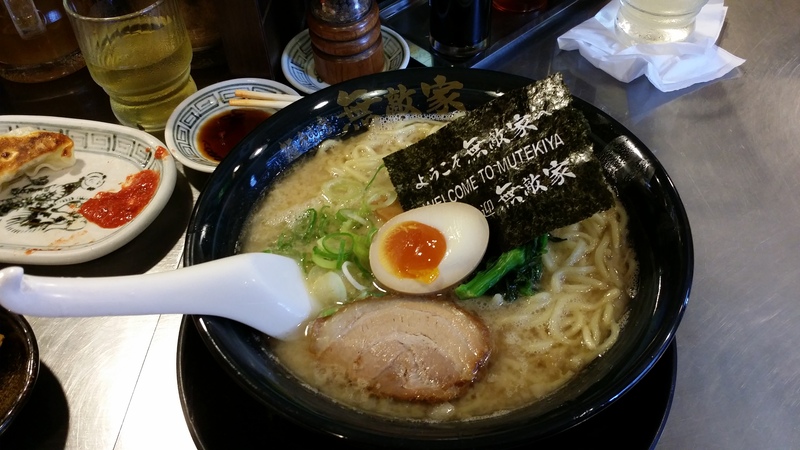 It’s my comfort food, and since I was staying at Ikebukuro, I had to try the Mutekiya Ramen (無敵家). 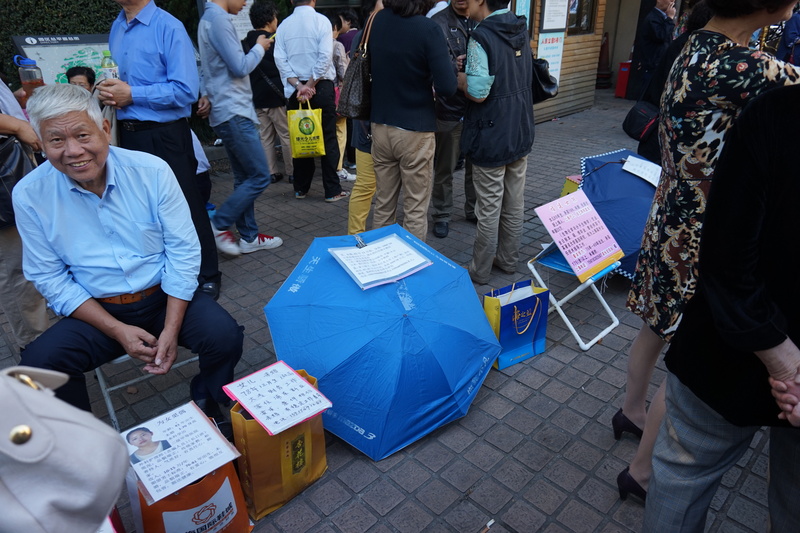 Address: 1-17-1 Minami-Ikebukuro, Toshima-ku 東京都豊島区南池袋1-17- (Ikebukuro Station East Exit), Tokyo, Japan. They open until 4a.m. so it’s the perfect place to go for a warm hearty supper after a night of drinking / partying. But really, you don’t need a reason to have good ramen. I went around 11a.m. before the lunch crowd arrived, but I wasn’t early enough. Standing in the hot sun for about 30 mins waiting for my ramen only whet up my appetite. Turns out it was good, but not fantastic-come-back-again-tomorrow kind of good. Only 六厘舎TOKYO Ramen at the Tokyo Station made me do that. 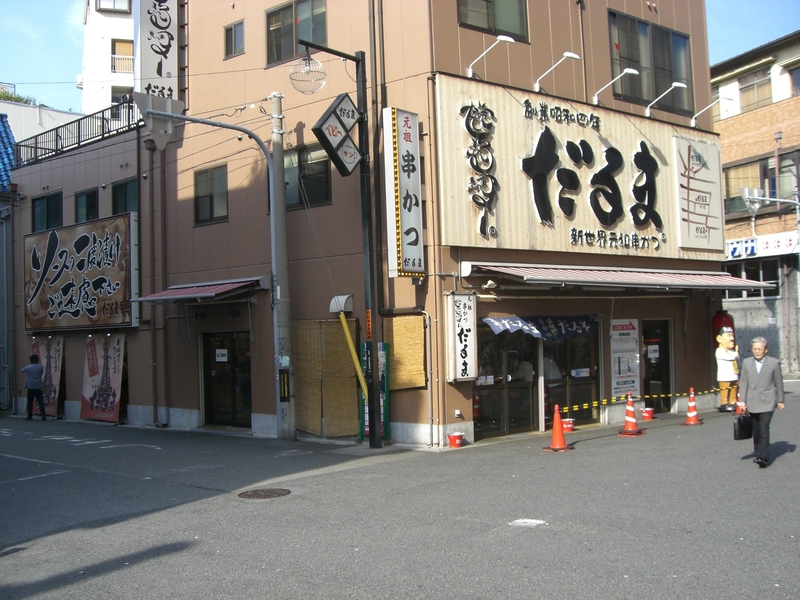 When you ask a Tokyoite about Monjayaki (もんじゃ焼き), inevitably Tsukishima Monjya street comes to mind. 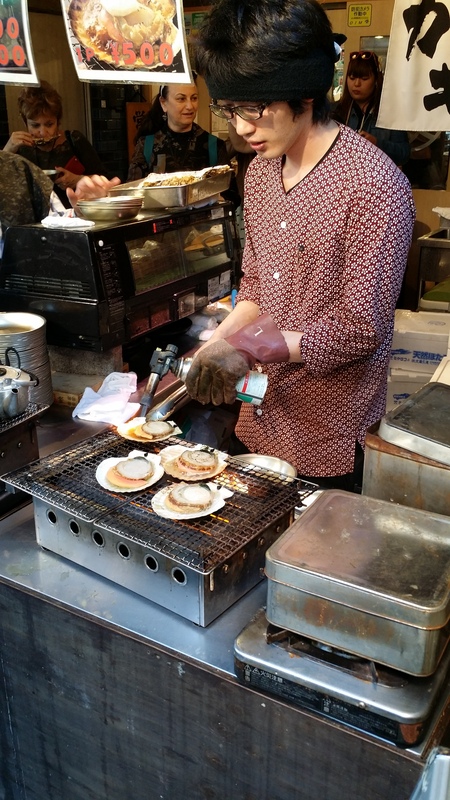 Monjayaki is a kind of Japanese-style pancake, in which you can cook it on the grill by yourself, and eat off it afterwards. I was recommended to go to Bambi, as it had an English menu and the food was decent. I guess I was there more for the experience, being a first-timer I think my Monjya actually tasted mediocre at best. I am really happy to have re-visited Japan, and I would take it up again in a heartbeat if an opportunity knocks on my door. It’s truly one of my favourite countries in the world. 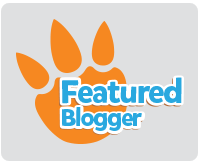 Now comes the exciting part – GIVEAWAY CONTEST! Comment on THIS blog post the city you would like to go next, and tell me why! Bonus points will be given for creative entries. Share this post on Facebook so your friends can be rewarded too. Contest dates are from 8 February 2016 – 29 February 2016. 20 lucky winners will be chosen and will receive a special promo code to download the app. Winners will be contacted via email, so please provide a valid email address. Based on the comment, the winner will get the specific city’s guided tour app. Please refer to this link for the full list of cities. GPSmyCity app is compatible with both iOS and Android devices. Good luck and happy travelling! Have you ever felt the mood to eat more during December? We all suffer from this syndrome called the Festive Season. Come Christmas time, everyone needs to be pampered and treated to goodies and snacks. 1. Snacking increases your productivity! 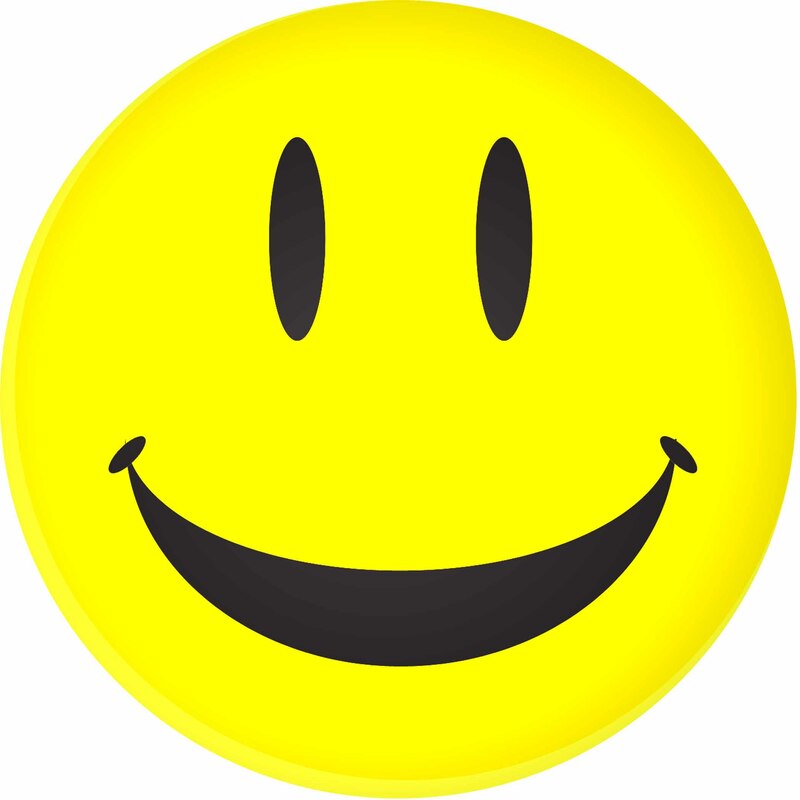 Do you know: The saying goes that a happy employee is a productive employee. Whenever you see a restless colleague at work (because it’s December and they can’t wait to do their Christmas shopping), offer them a snack and you will put a smile on their face. 2. Snacking doesn’t require you to think! Do you know: Snacks4me is a new type of ‘Snackerzine’ that brings you the latest and most talked about snacks right to your doorstep. Every month, Snacks4me will search through various parts of the world to bring you a carefully curated box of snacks that is full of surprises. Snacks4me is committed to challenge your palate with the weirdest and most exotic taste combinations you could ever imagine. Some of these limited edition snacks aren’t even available on the local market, and it will be delivered straight to your doorstep. You don’t have to squeeze your brain juice to think of what special snacks to buy. You don’t have to travel to faraway places to buy your limited edition snacks. does the hard work for you, so you can just relax. How awesome is that! For a limited time only, Snacks4me is offering a special 20% discount for all new orders. This is a unique way to give your loved ones a Christmas present this year! Go ahead. Buy a box for your family and friends. But most importantly, remember to buy for yourself too!! 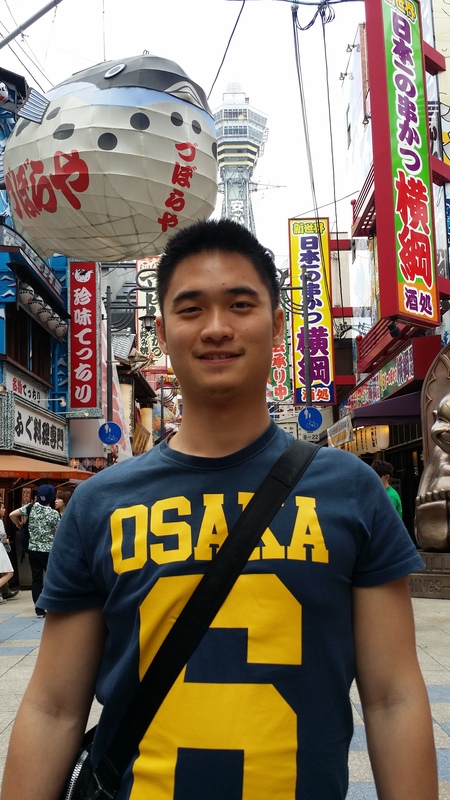 I’m back to blog about my trip to Japan several months ago. This second part will be on Osaka (food) and Tateyama Kurobe Alpine Route (scenery). These two places are actually not near each other, so I was maximising my JR Pass to travel to farther places. 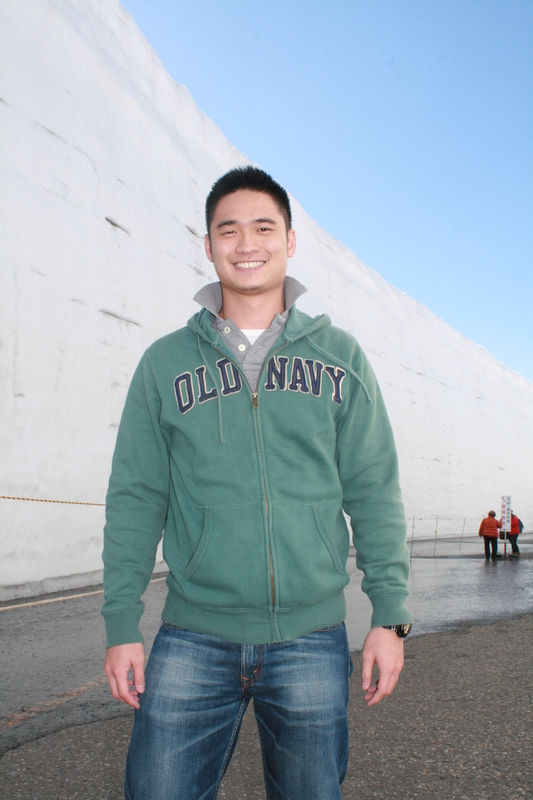 The biggest deterrence for most people is the time taken and cost of the journey there, but I’ll go into details later. This is my second time to Osaka, and the streets of Namba still impress me. If I were to stay here, I’ll be a chubby boy in a couple of months. There’s just so much food to eat, and the nightlife here is so much better than Singapore. My hotel is a 5 minutes walk from the main Namba shopping area and it was super convenient! Osaka Floral Inn Namba was about $125 a night when I booked it during the golden week holidays. It’s a little run-down and the room is not nicely decorated/modern, but I guess I’m just paying for the location here. When you visit Singapore, you got to have Chilli Crab. 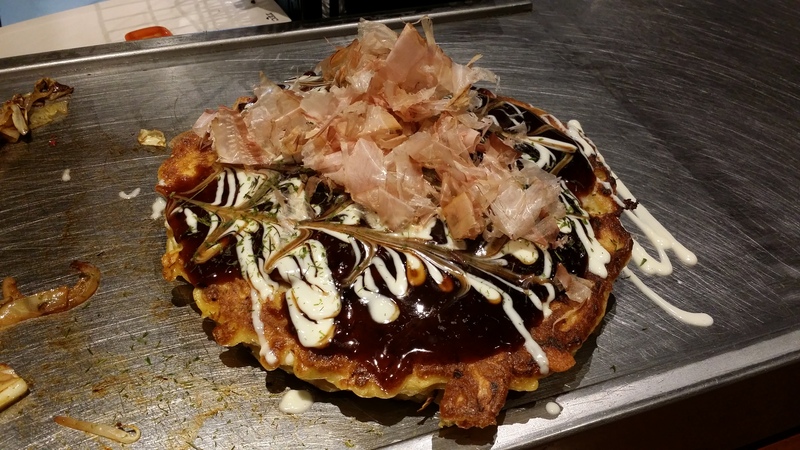 Same rule applies when you’re in Osaka, you must have an Okonomiyaki! I had my serving from Chibo restaurant, just a bit further down from that famous “crab restaurant”. 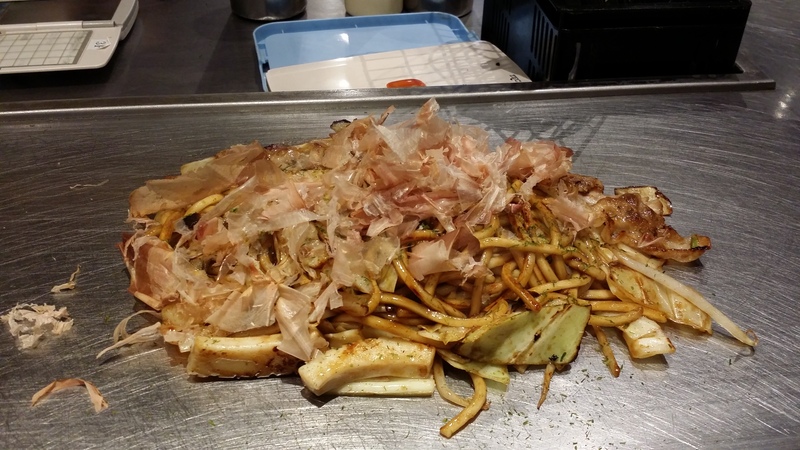 I was greedy as usual, so I ordered both the Okonomiyaki and the Yakisoba to try. If you’re interested in seeing the chef in action, please watch below! 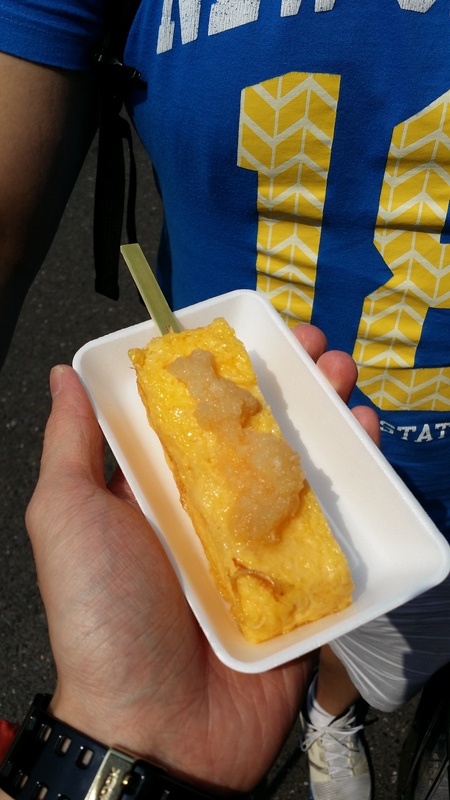 Verdict: I should have just stuck to the Okonomiyaki. It was too filling to have both. The Yakisoba was good, but not worth my limited stomach space. One cannot simply walk across Dotonbori bridge without impersonating Glico Man. As mentioned previously in my Osaka post 2 years ago, Pablo cheese tarts are worth the queue for. 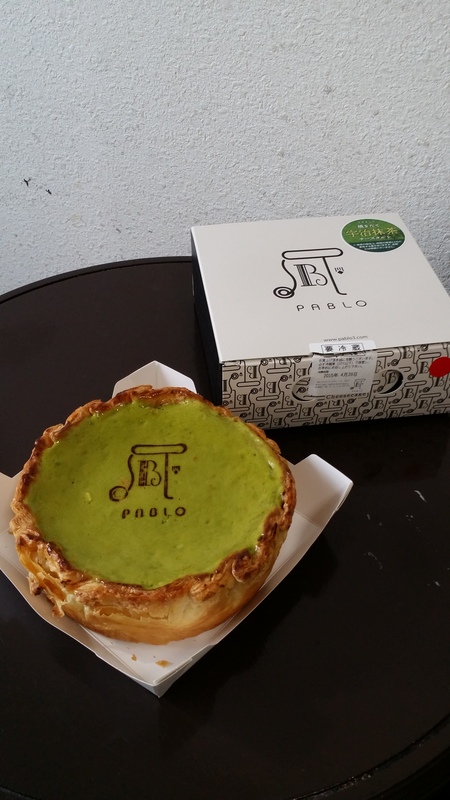 This time when I got there, Pablo introduced new flavours like Matcha (my favourite) Cheese Tart! It was so good because they combined 2 of my favourite ingredients together. I decided to be a little touristy and scheduled a visit to the Osaka Aquarium Kaiyukan (海遊館) to look at fishes and their famous whale shark. 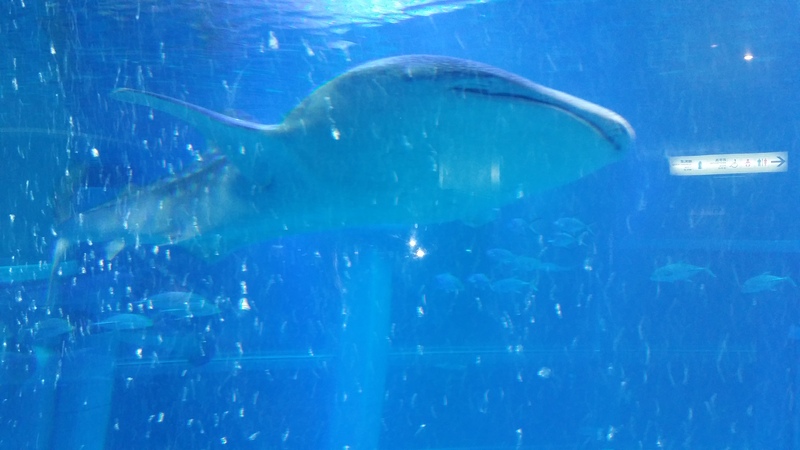 Entrance to the aquarium costs 2,300 yen, and you get to see the star of Osaka’s aquarium – the majestic Whale Shark. The sheer size of the glass enclosure is enough to impress, not to mention this beast swimming inside. 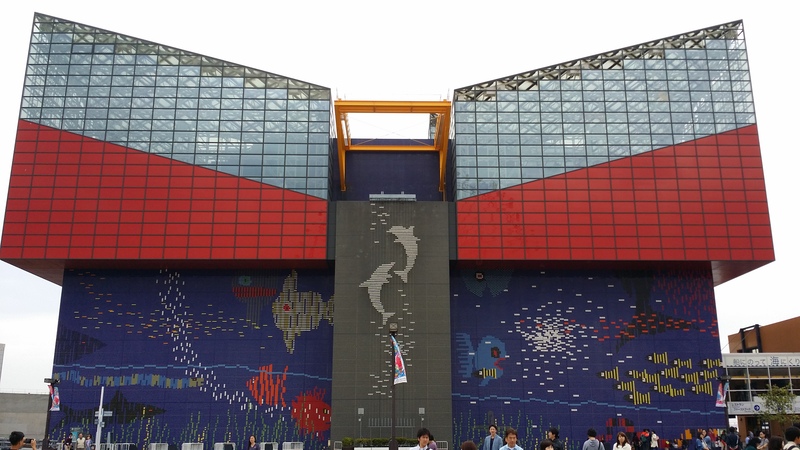 The Osaka Aquarium Kaiyukan is located on an island near the heart of Osaka, and is easily accessible by the Chuo Line (Osaka-Ko Station). 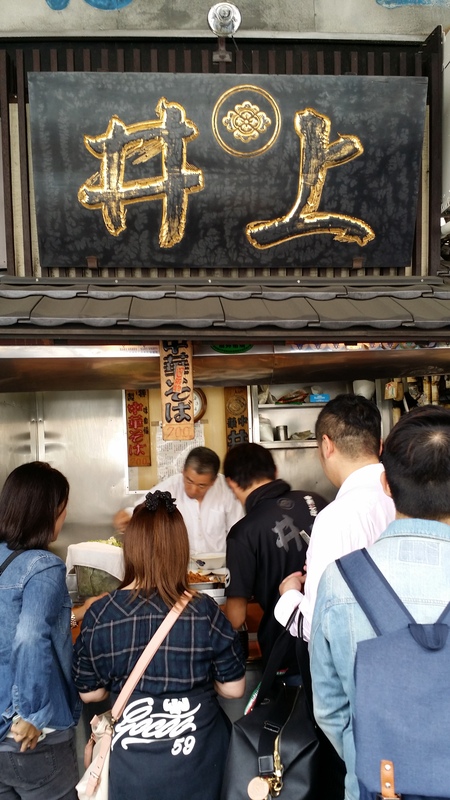 If you still have some time left in Osaka, do visit the vibrant Shinsekai (新世界) district and try the Kushikatsu (deep-fried skewers) from Daruma! 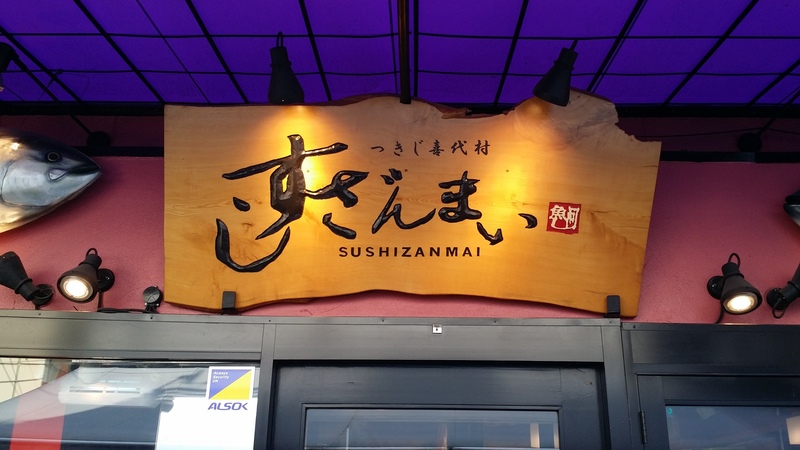 There are many bright 3D signboards that are sure to capture your attention, and they are also great for taking photos! 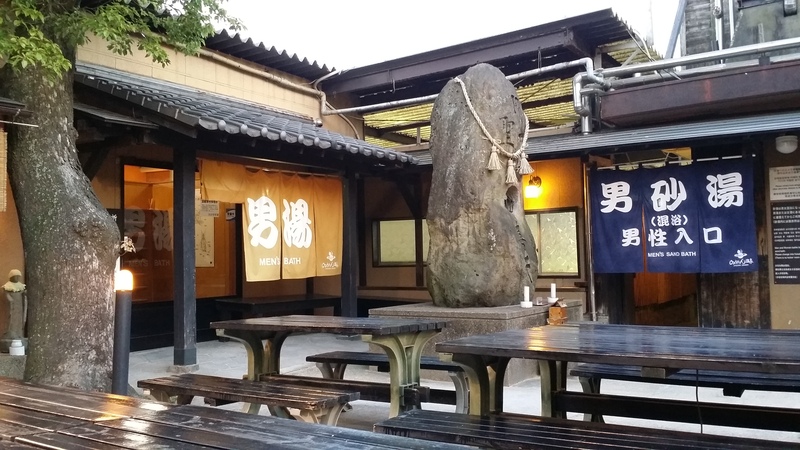 By now if you haven’t already gone to an onsen during your Japan trip, it is recommended to drop by Spa World that is conveniently situated at the end of Shinsekai. It is a huge multi-storey onsen complex. I went there 2 years ago, and I thoroughly enjoyed it with the various European and Asian themed onsen. No pictures here for obvious reasons haha. They alternate the onsen for males and females every month throughout the year, so you have to go at least twice to try out all of them. 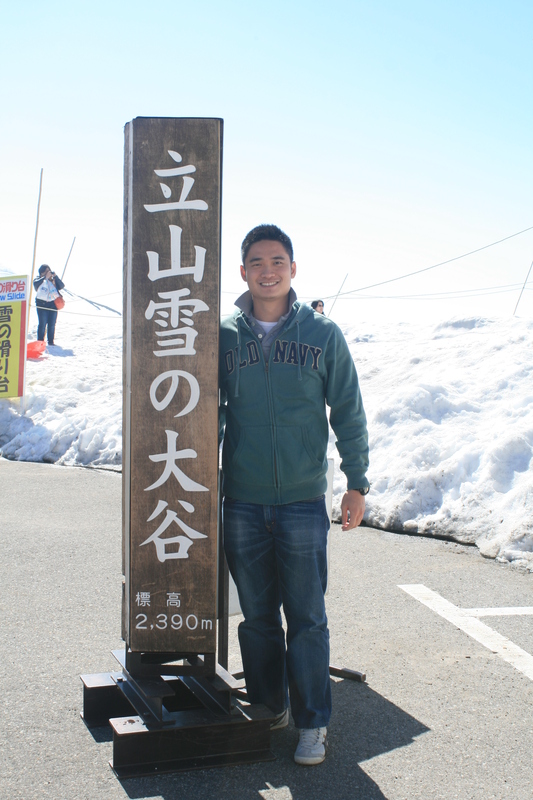 After Osaka, I embarked on my journey to the Snow Corridor at Tateyama Kurobe Alpine Route. Open to pedestrians for only a few weeks every year, you can traverse a path that has up to 20 metres of snow on your left and right. It is a long and expensive journey, but the experience there was well worth it. Here is an extract of the different modes of transport you have to take just to enjoy the view. The total cost for my two-way trip turned up to be more than $70 (non-JR) even though I travelled from Osaka Station to Toyama Station with my JR Rail Pass. Here’s a simplified route map. Don’t worry it is not the same cable car as Sentosa-Mt. Faber, instead it looks like this. The section with the snow corridor that you can walk and take pictures will be at Murodo, 2450m above sea level. 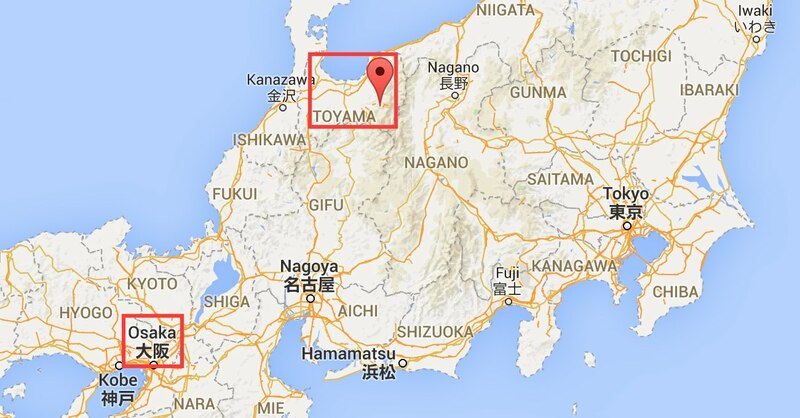 You can either choose to continue on the journey all the way through, or make a turn back to Toyama. I chose the latter because it’s faster and cheaper to do so, and it was getting dark already. Do note that because I travelled from Osaka, I took more than half a day to reach Murodo and barely had 30 mins to cam-whore and selfie till my heart’s content. It is advisable to factor in much more travelling time, especially since these local transport may run once every 30 mins or once every hour. 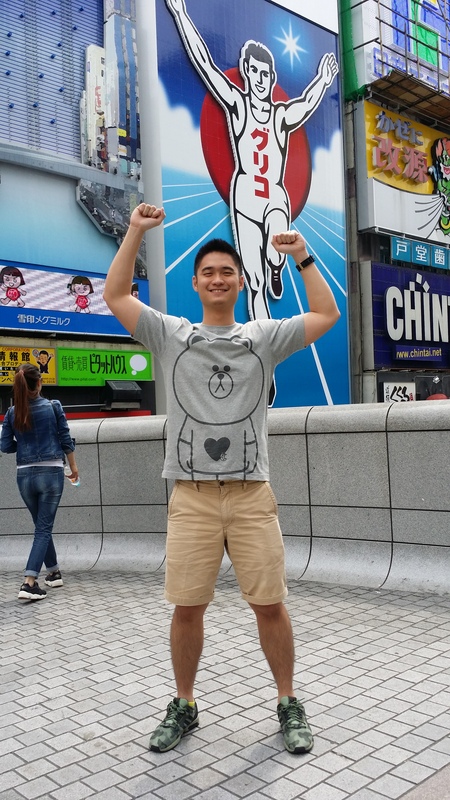 Hope you enjoyed this second part of my Japan Trip 2015! Do read my the first part here – Click here! 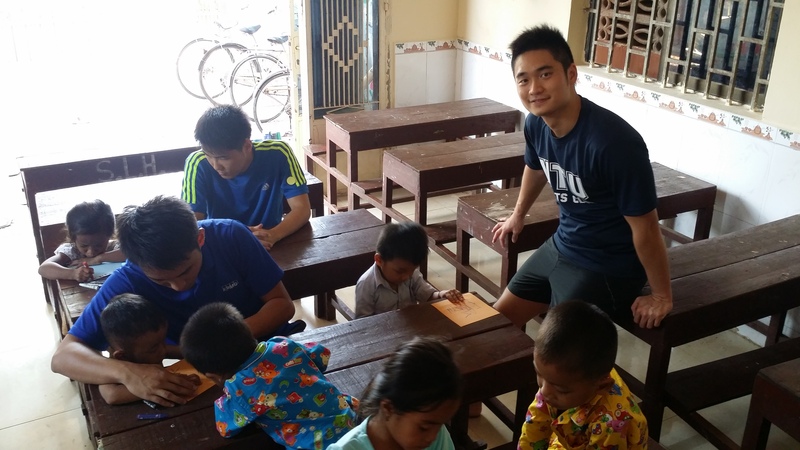 KPMG puts emphasis on Corporate Social Responsibility, and the Give Time initiative is an excellent opportunity for employees to take some time off work and participate in meaningful volunteering work. A group of 4 of us jumped on this chance given to us, and researched on which organisations we could help. Our fellow colleague recommended Save Poor Children in Asia Organisation (SCAO), which we thought was an excellent Non-Governmental Organisation (NGO). 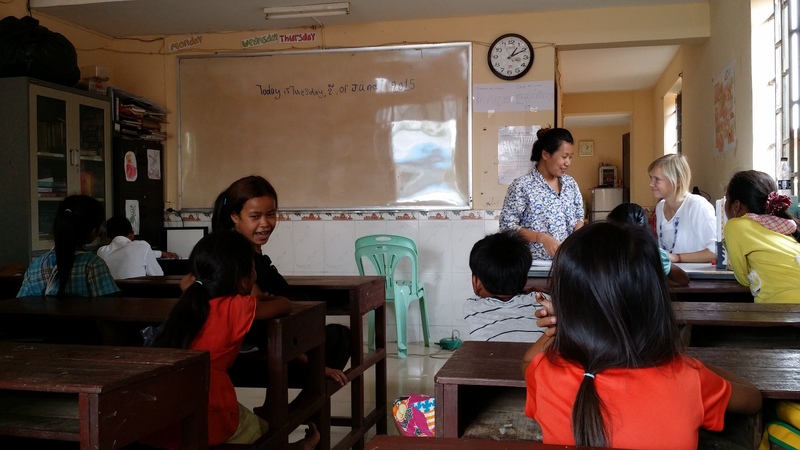 Their objective is to educate poorer children in rural villages outside of Phnom Penh. Do take some time to check out their website! We liased with head volunteers Lennart and Luzie, both of them are long term volunteers in charge of SCAO I and SCAO II respectively. There are two schools at the moment, with a third school in the works. SCAO I is nearer to the city of Phnom Penh, whilst the newer SCAO II is located at Som Roung Village, 18km and an hour’s drive (via Tuktuk) North of Phnom Penh. 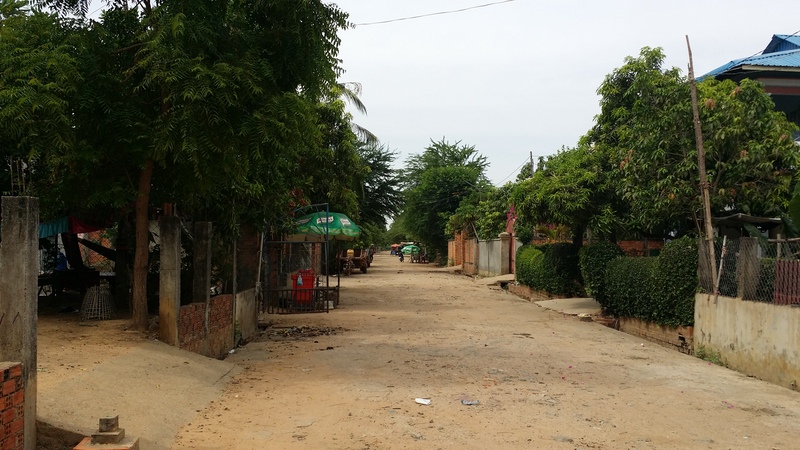 The village is home to about 550 residents, and most of them do not have the luxury of living in a concrete/brick house. Many stay in wooden huts along the small dirt roads, or on stilts that are lined up along the rice fields. SCAO II is a house built and funded by several international donors, and the classes are conducted on two floors that were converted into classrooms. Us volunteers stay in the same house, so it is really convenient and saves us travelling time. On a daily basis, volunteers take turns to conduct classes. There are Pre-School, Intermediate, Advanced, as well as evening Conversation classes. Lessons start from 9am, and sometimes end at 8.30pm. It’s not an easy job teaching from morning till night! 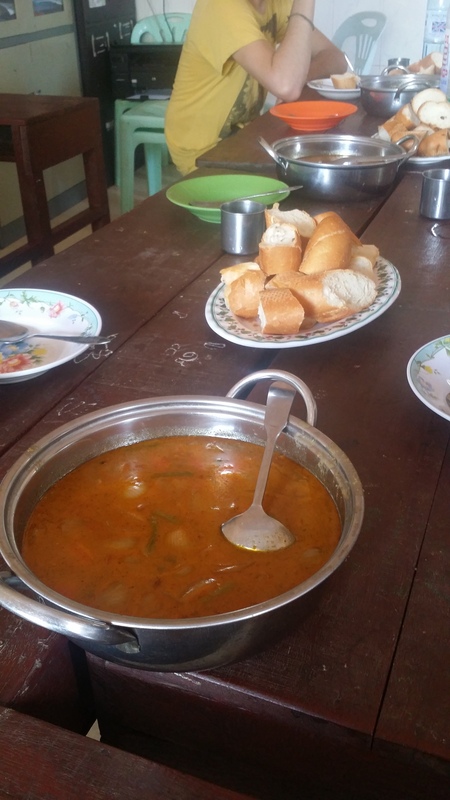 Thankfully for us, home-cooked meals are provided during breakfast and dinner by Sovanred and his family, who lives in SCAO II and takes care of the house. The communal meals typically consists of rice, and two dishes of vegetables such as cucumber, pumpkin, yam, beansprout, or onions. When we’re lucky we get Khmer curry with bread! Because of the busy schedule and the living conditions, volunteers here generally skip lunch. It’s a joy to teach enthusiastic children, who are all so eager to learn and practise English. Some of the students have been with the school for more than 2 years, and it’s heartening to listen to personal stories about how much they’ve improved from attending lessons taught by the volunteers at SCAO. In a village/kampung, everyone is really friendly and the first phrase they use to greet foreigners is a chirpy “hello!”. It felt welcoming to walk down the road to the coffeeshop, and the kids whom you’ve taught just a few hours ago will run along, smile, and wave “hello”. I guess these are the kind of experiences you won’t get to enjoy back in the big bustling city. During the night, we worked hard to give the walls a fresh coat of paint. It was our first time painting (walls) and we were worried initially that we would screw up their house and they’d be the ones living with our “artwork”. In the end, we didn’t fare too badly I think. 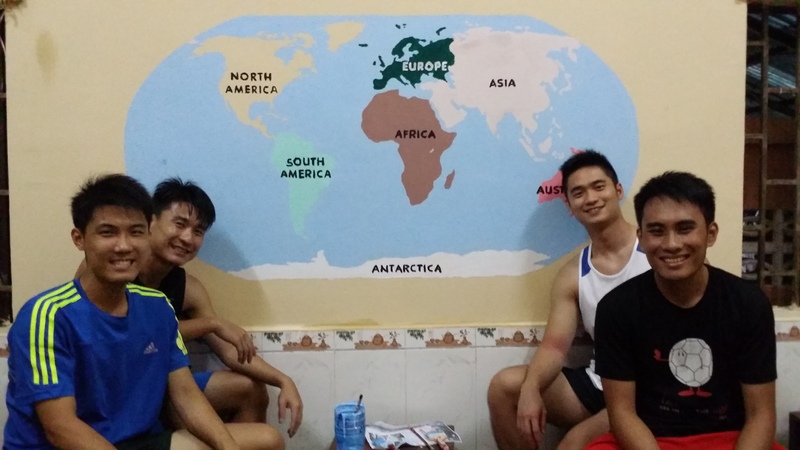 We even done up a mural of the world map for the children to learn about the continents. 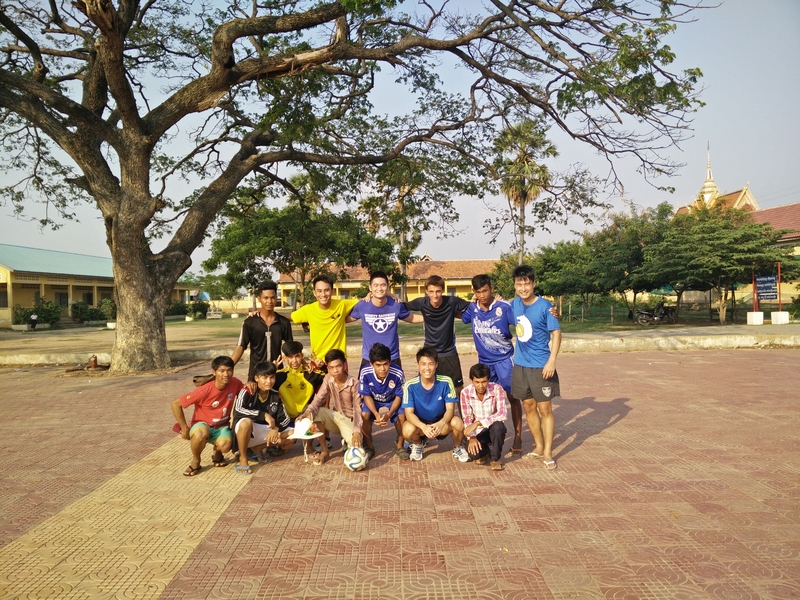 After working hard, we took some time off to play soccer with some students of SCAO. They were really good for sure, with mad dribbling skills. 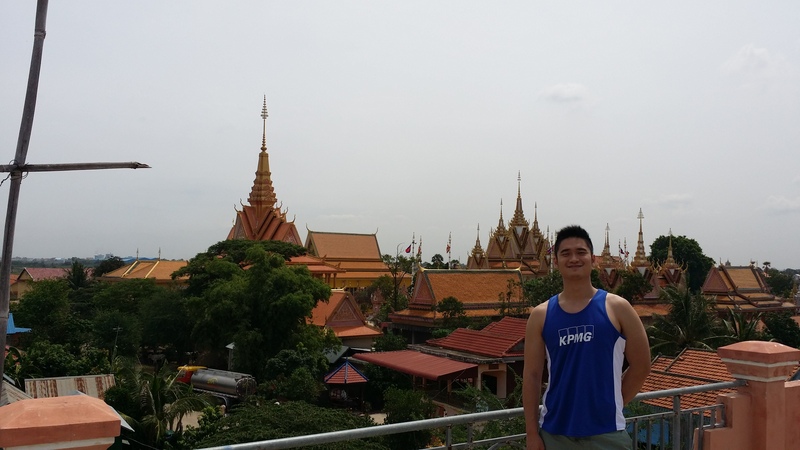 However, in the Cambodian heat we lasted about 20 minutes before we had to call it a day. Unlike the other volunteers who are used to skipping lunch, the four city boys couldn’t take the hunger pangs. 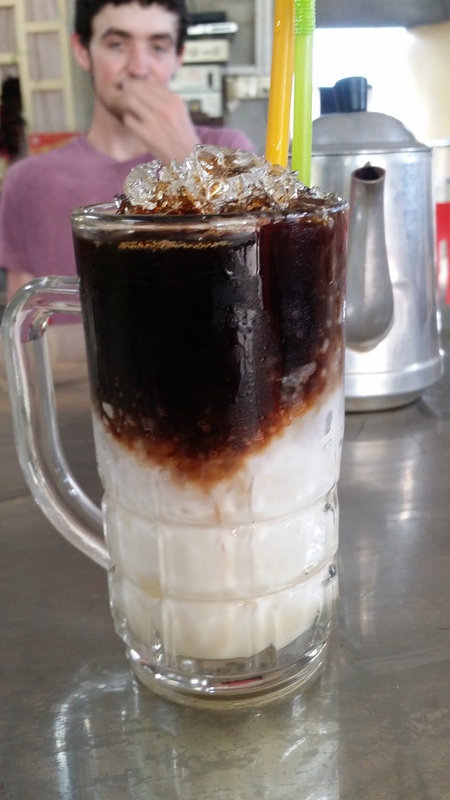 They kindly introduced us to their local coffeeshop that sells the best Cambodia milk coffee, and also a street stall that sells instant noodles with egg. It was our saviour. 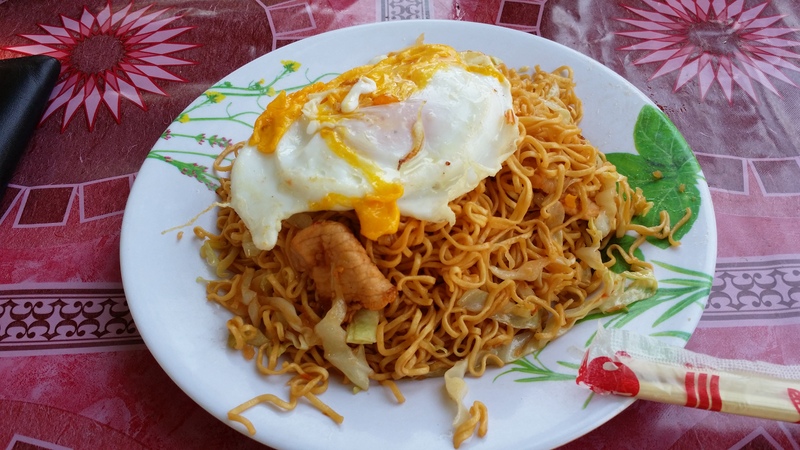 I think this plate of noodles costs 75 cents. Our not-so-secret hangout during this trip has got to be the rooftop. Imagine sitting under the stars, with a can of beer, and just chilling with friends in a foreign land. It’s something that’s not replicable back in Singapore, especially with this unbeatable view. It pains me to leave within such a short time; feeling like I could do more to help out. If anyone reading this is interested in giving, please contact SCAO to find out how you can benefit the children in one way or another! They are currently in the discussion to build a 3rd school, and I’m sure any sort of funding will be beneficial. After a long hiatus, I’m back with a series of blog posts about my most adventurous and impromptu trip thus far. I booked a return ticket (whilst it was on promotion of course) and flew off to the land of the rising sun. This was all done within a course of 2 months during my work’s peak period, and it gave me something to look forward to at the end of the April. 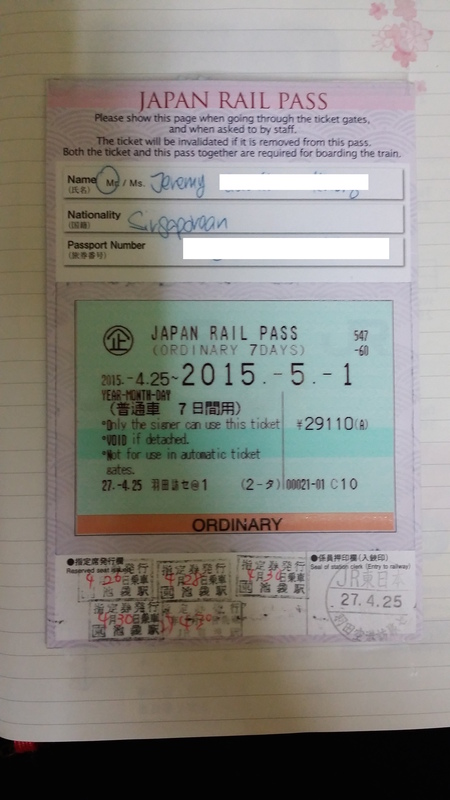 This journey required the use of a JR Pass, so I had the advantage because of the weakening yen. I paid $341 from the JTB at Ion Orchard, and I’m able to take almost all the Shinkansen in Japan with reserved seating! A travel tip to everyone is to plan early before you arrive (I use Hyperdia http://www.hyperdia.com/en/ ), and then reserve ALL your seats the moment you arrive in Japan at the JR ticketing booth. That means you must plan on a detailed level, down to the exact timing and exact Shinkansen that you’re going to take for the rest of your stay in Japan. If unfortunately you miss your Shinkansen timing and you must forfeit your reserved ticket, it is actually at no extra cost for you to book another later timing, just that you run the risk of the Shinkansen being fully booked. Note: You cannot take the Nozomi & Mizuho lines, but you are able to take the next fastest Hikari & Sakura lines. Honestly, it doesn’t matter unless your schedule is so tight that 15 minutes more for a 3 hour journey makes a difference to you. This is the all powerful and mighty JR Pass. You just flash this to the ticketing officer at the gantry and you shall pass. It’s actually one of the more affordable ones (I compared prices against those at the airport itself, and it’s cheaper to get online in advance). The best part is that they deliver straight to your hotel/accommodation/airport before you arrive! I got the Y!mobile 3G 7.2-21Mbps unlimited data usage plan and it works out to be $7 per day. To fully maximise this unlimited usage, you can share it with up to 5 devices and the daily cost is really minimal. 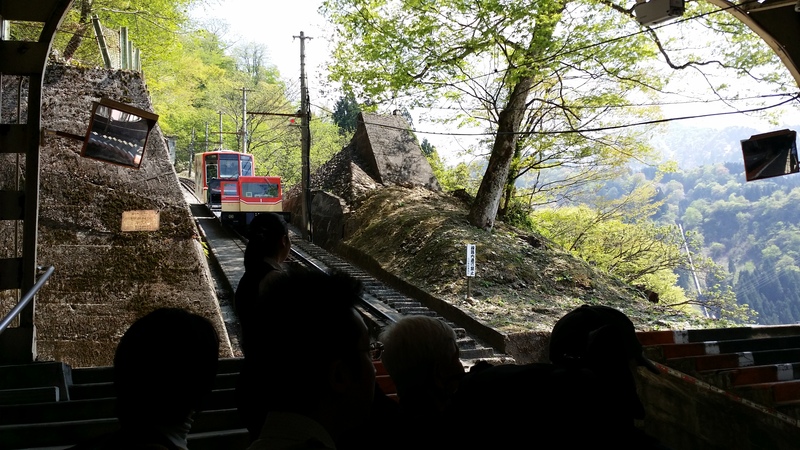 Ok enough about the boring planning part, the rest of this post shall be dedicated to my short tour of Kyushu. 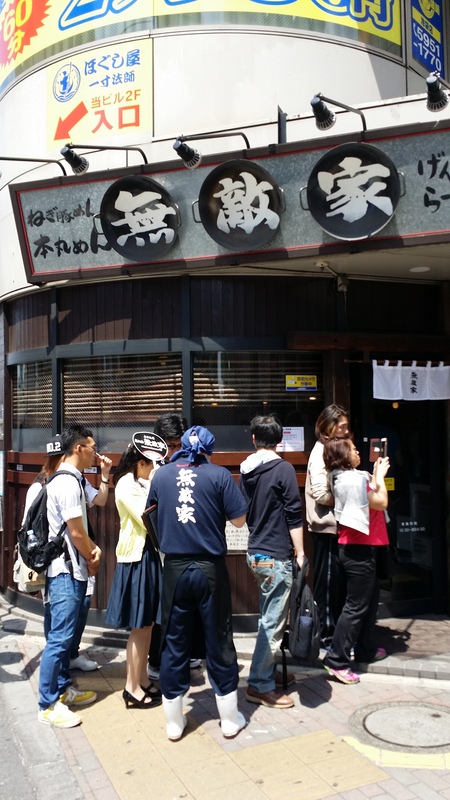 Due to time constraints, I visited only 2 locations in Kyushu. 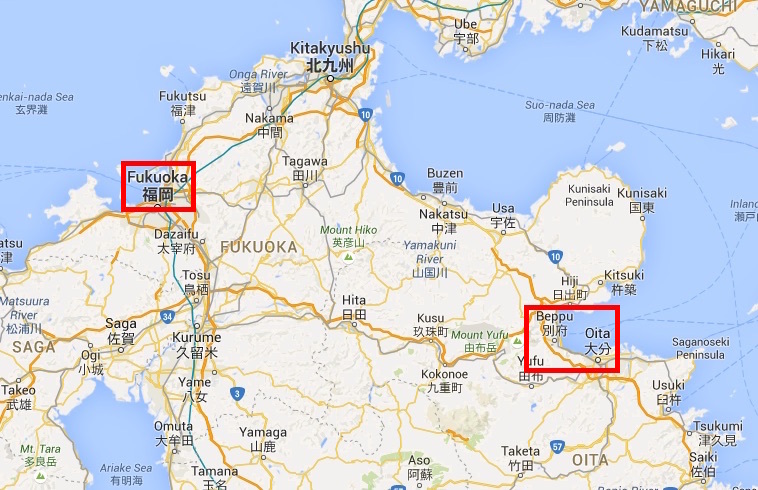 They are Oita Prefecture (大分県) and Fukuoka (福岡). As seen from the map, they are on the northern part of the Kyushu islands. A short ride away from Oita city is the famous hot spring town of Beppu. It is also home to the 8 Hells (地獄 Jigoku) of Beppu. 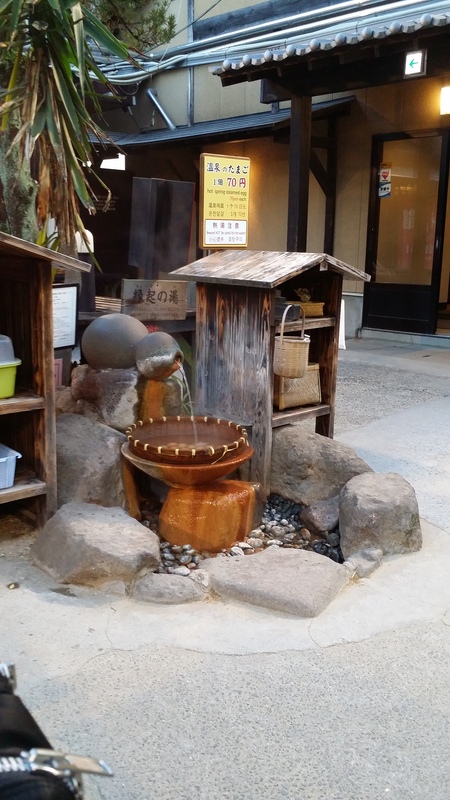 I skipped the sight-seeing and went straight to the real thing itself, the onsen. The one I went to was relatively secluded, and is actually near the “geyser hell”. It’s called Hyotan Hot Springs. The place is definitely English friendly, so it wouldn’t be a problem even if you don’t speak Japanese. The sand bath that you have to pay an additional 300yen for is a bit over-rated in my opinion. I had to dig a hole and bury myself with sand that was barely lukewarm. The hot spring itself was better, especially with the special waterfall feature that helps to massage my neck and back. I tried the Hot Spring Egg! Disclaimer: It tasted really normal. After a short 1 night stay at Oita, I departed for Fukuoka, the gateway to Kyushu. 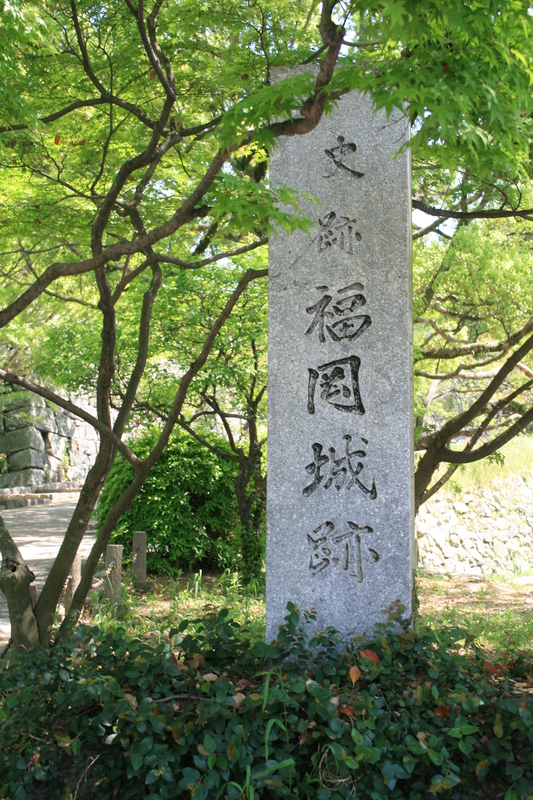 I chose to do something touristy, and visited the Fukuoka Castle Ruins because it was one of the top destinations on TripAdvisor. And then I remembered why I shouldn’t trust these review websites. There was barely any ruins left to see, and the “Castle” was not recognisable at all. I guess it was good for a morning stroll if it was the Sakura season, as all I saw were wilted pink petals on the grass. However, there was something else that caught my attention. I kept seeing these two words “放題” around, and when I found out that it actually means “eat-all-you-can buffet”. I knew I had to go for it. Especially when it also comes with “飲み放題”, which means free-flow alcohol as well! 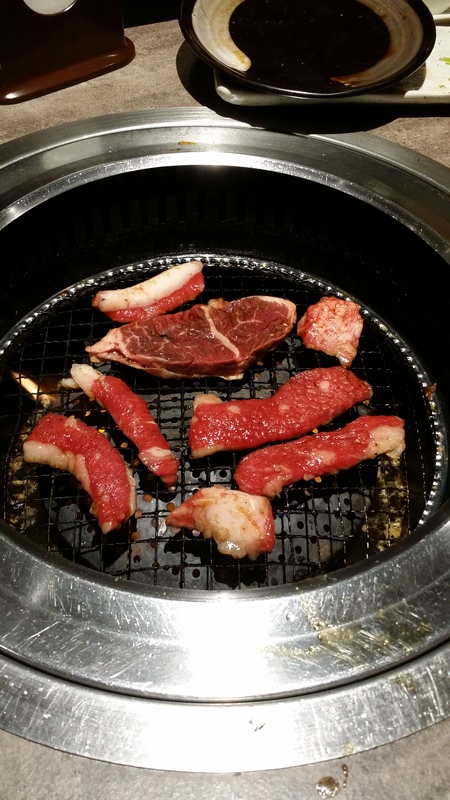 The place is at Yodobashi-Hakata (ヨドバシ博多) 4th Floor called “焼肉の牛太”. I know meat and highballs don’t pair well, but I couldn’t care less. I honestly didn’t explore much of Fukuoka, and it was a shame that I had to rush off to Osaka after just 1 night here. 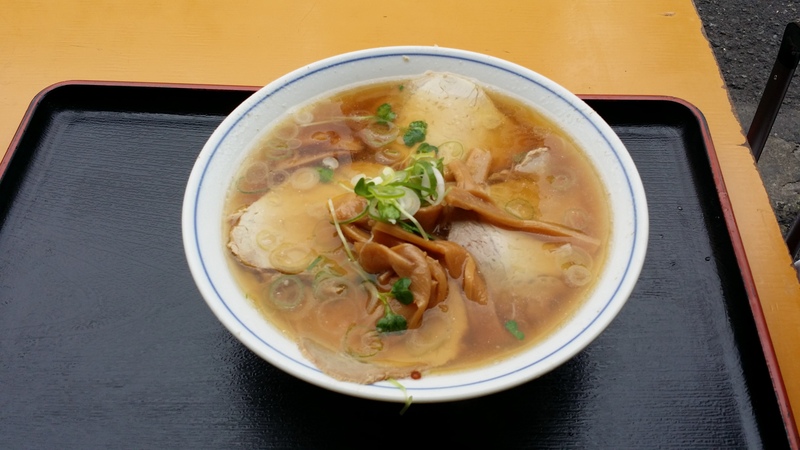 There’ll be more interesting food and places in the next post, including my trip to the famous Tateyama Kurobe Alpine Route! 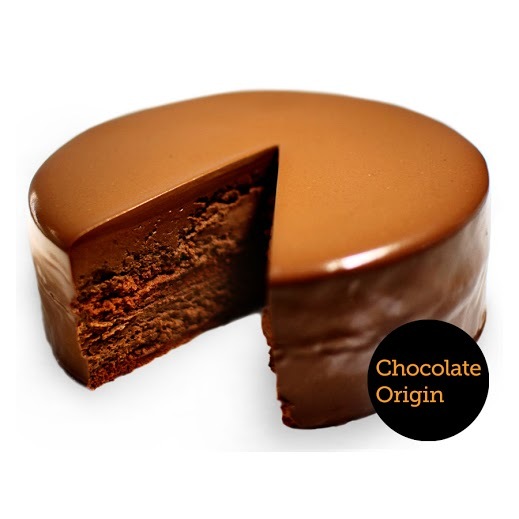 I’m sure some of you, my friends, have heard about or tried Chocolate Origin, known for its amazing chocolate cake that’s the best in Singapore (as voted by myself). They come in Original or Dark. Simple, elegant, and rich in flavour. Their cake needs no raving reviews because there are plenty out there already. 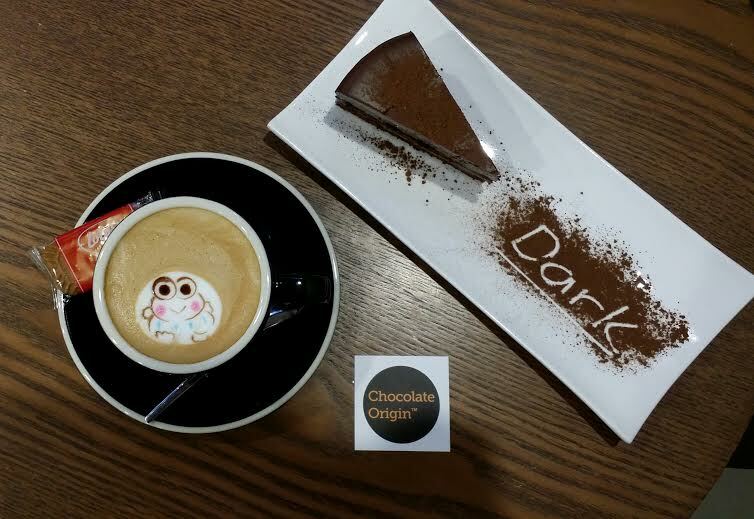 What grabbed my interest this time round was the cute latte art that’s available at their outlets in Bugis Junction and Kallang Wave Mall! 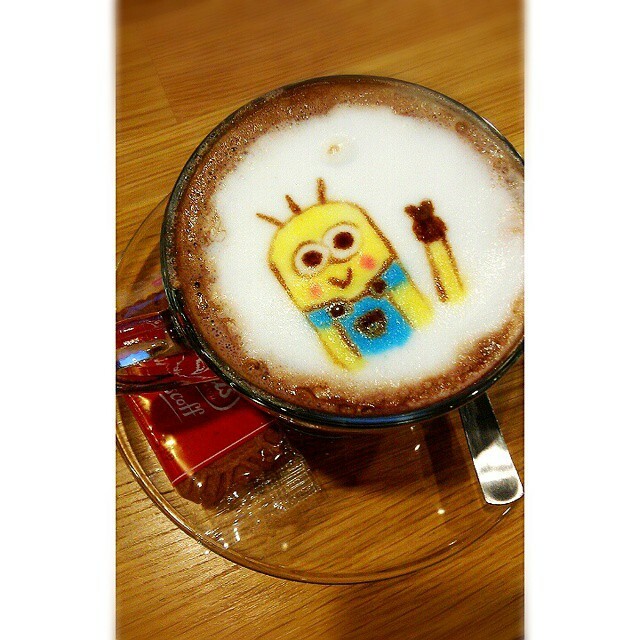 Check out these 3D latte art creations. 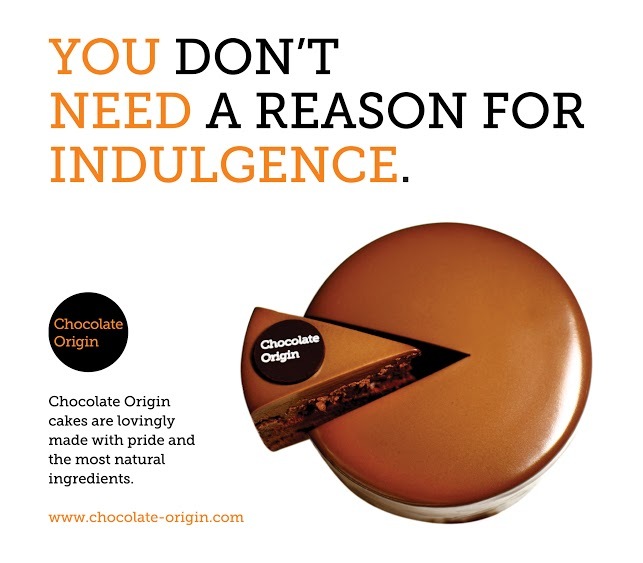 They go perfectly with Chocolate Origin’s Cuppa Lava Cake, or a slice of their speciality bitter-sweet dark chocolate cake. Here’s their website so go check them out! 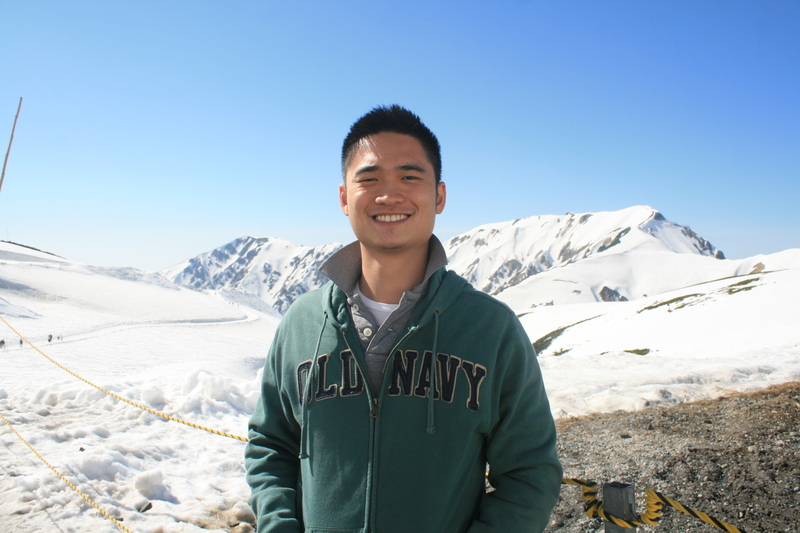 Safety – Since it’s my first time traveling alone, I don’t want to be too adventurous and go to countries that might be a little bit dangerous. I also don’t want to be helpless, so being able to speak the local language is a must. Price – Nothing expensive, therefore Asia will be the continent of choice. Things to do – no shopping. Exploring the local sights and cuisine will be preferred, followed by other tourist destinations. I vaguely remembered it was thanks to Winston that sparked off this idea, roughly about half a year ago. 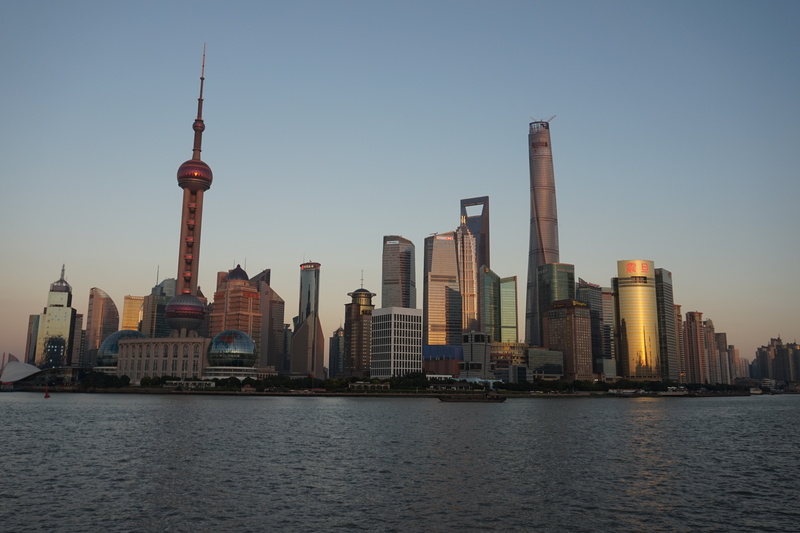 He suggested Shanghai because it is a financial hub with skyscrapers (Pudong) and yet retains much of its historical architectures (French Concession/The Bund). The opportunity arose during the Deepavali long week-end break, so I immediately applied for leave and booked a ticket on China Eastern Airlines ($435 return). There’s no budget carrier to Shanghai so this was the cheapest ticket I could find. I should also thank my friend for letting me crash at his house in order to save on accommodation. The first cool thing was the Shanghai Maglev train (上海磁浮示范运营线), which uses magnetic levitation technology and can reach speeds of up to 430km/h!! The ride from the Pudong International Airport (浦东国际机场) was smooth, comfortable, and only took 8 minutes to reach Longyang Station (龙阳路). From there, the city is well-connected through the Shanghai Metro Network. Taking a bus might be more convenient sometimes, but for a first-timer it can get very confusing to locate the correct bus stop and the correct bus service to take, so I wouldn’t recommend it. You can use this link to plan your journey. 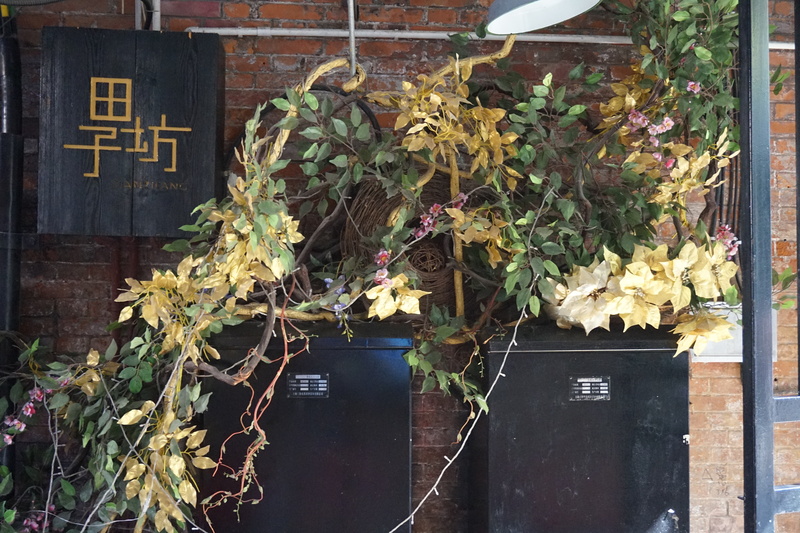 The first place I know I’ll like is Tianzifang (田子坊), which sells a myriad of souvenirs, decorations, and other interesting 有的没的东西. 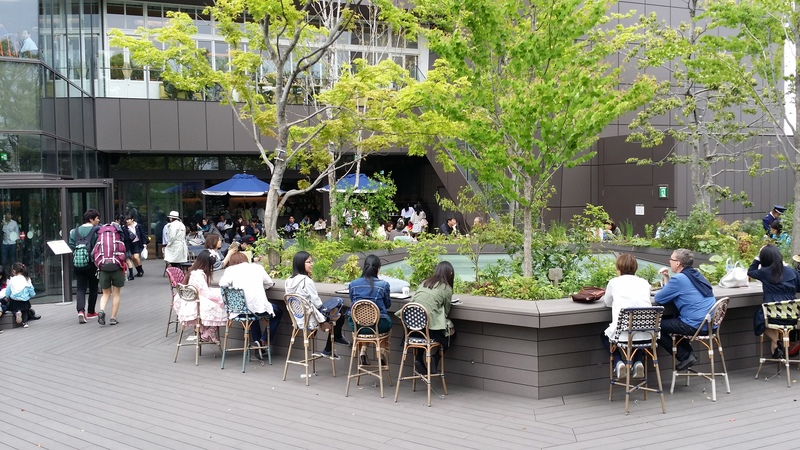 There are also cafes and restaurants amidst the maze of shops, so if you get tired of wandering around and finding yourself in the same area again, you can take a break to rest your legs. 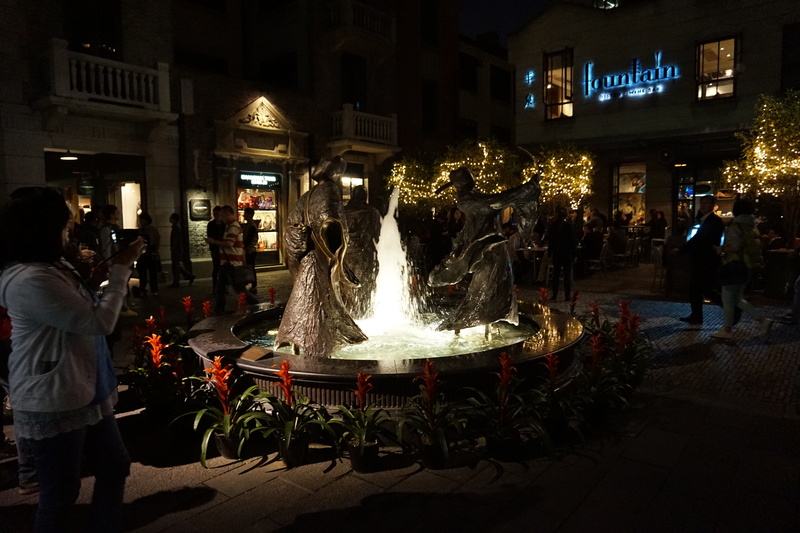 I was highly encouraged to go to Xintiandi (新天地), the expatriate’s hangout for drinks. The Shikumen (石库门) buildings houses many bars and restaurants, but I didn’t really fancy an expensive western-style meal there, so I gave them all a miss. 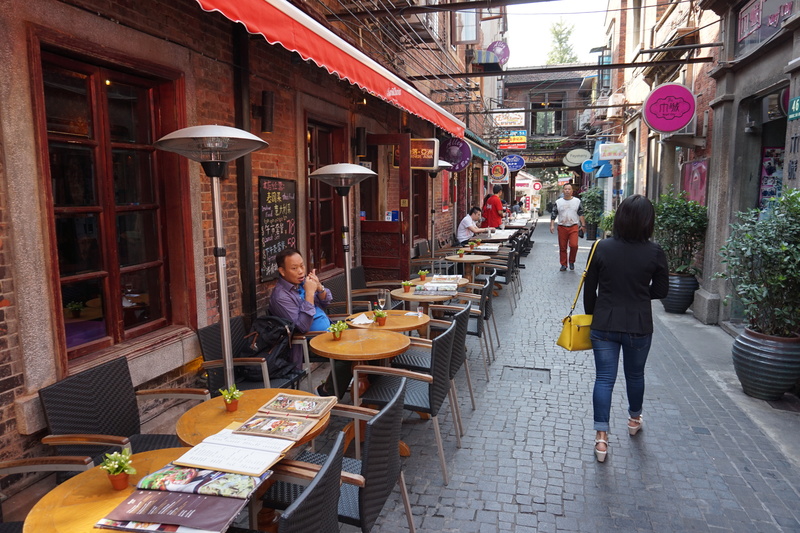 Another area that was on the top of my list is the Shanghai French Concession (上海法租界). 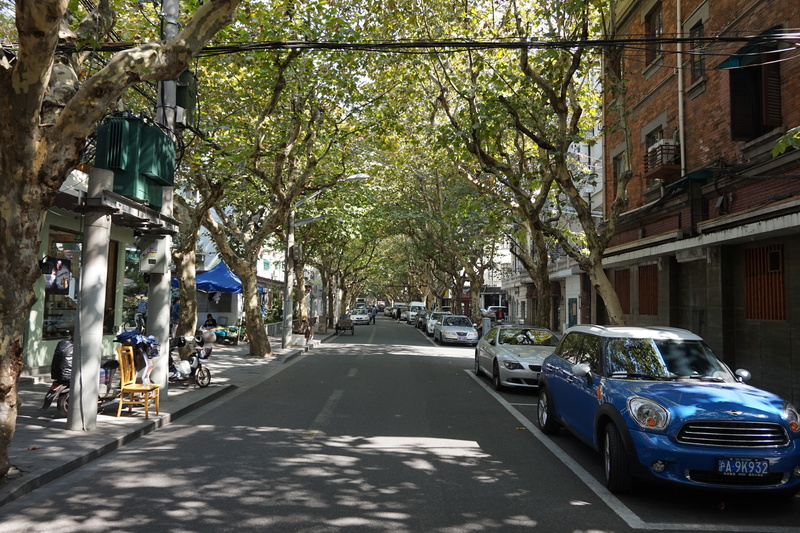 Rows of trees line up the quaint streets; it doesn’t feel like I’m in a bustling city. I was aiming to explore this area on foot, so I walked around for a few hours and when I get tired, I’ll find a cafe to refresh myself with coffee and do some reading. 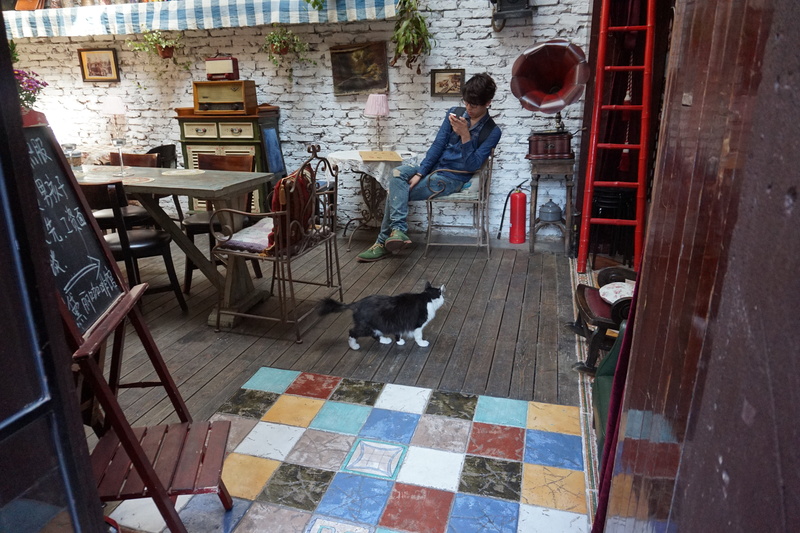 You might be wondering how I chance upon good cafes in a foreign land. My helpful friends recommended me a mobile app called 大众点评. 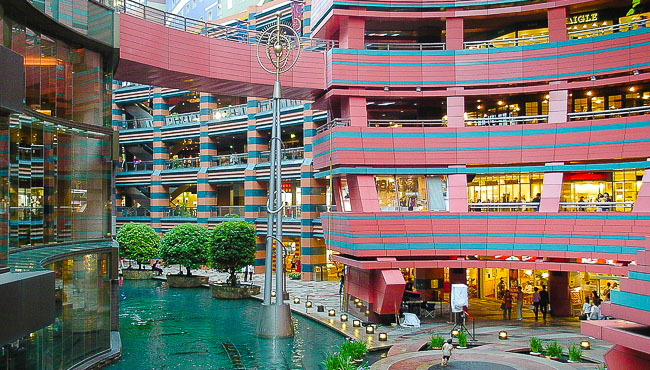 They are able to share the locations via Wechat, or I can browse what are the popular places around me. You can access the web version via this link. 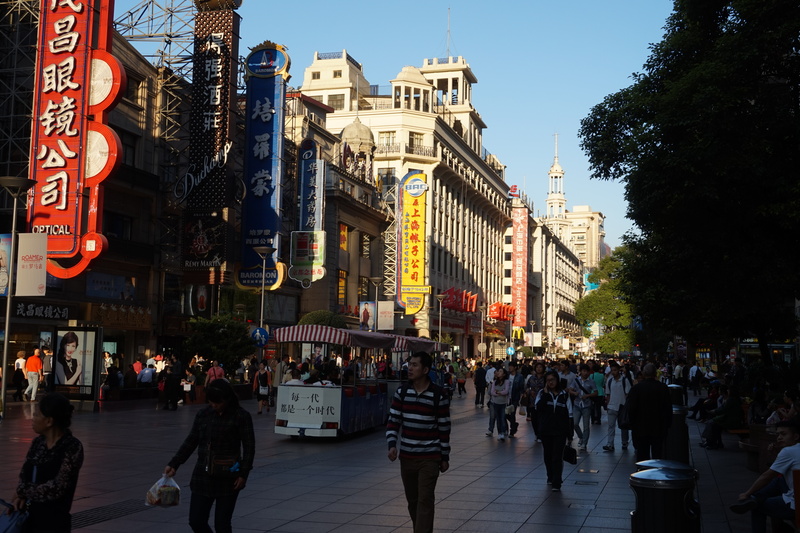 There were no lack of shopping malls in Shanghai, especially along the whole stretch of Nanjing West Road (南京西路) to Nanjing East Road (南京东路). I went in to take a quick look at Adidas / Superdry and was shocked to find out the price of a tee shirt there is twice the price of a tee in Singapore. That explains why Chinese tourists flock to everywhere else and buy so much stuff; simply because it’s way more expensive back home. 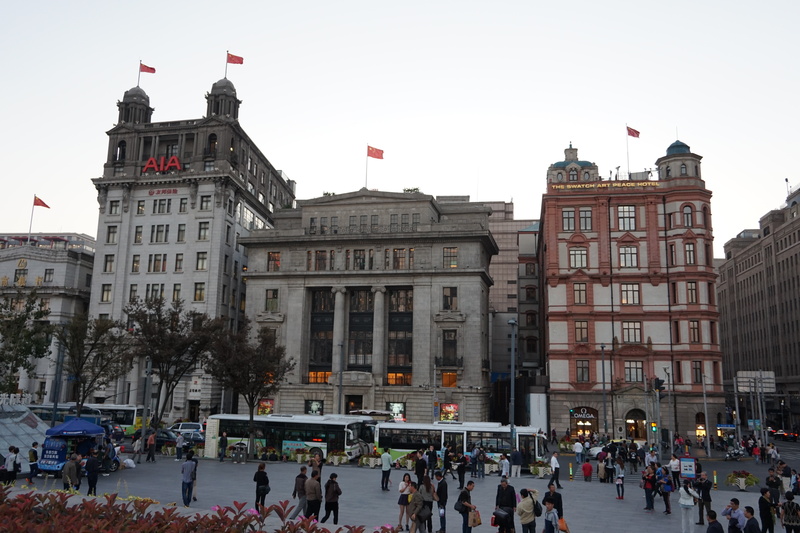 At the end of Nanjing East Road (南京东路) is the iconic landmark The Bund (外滩). 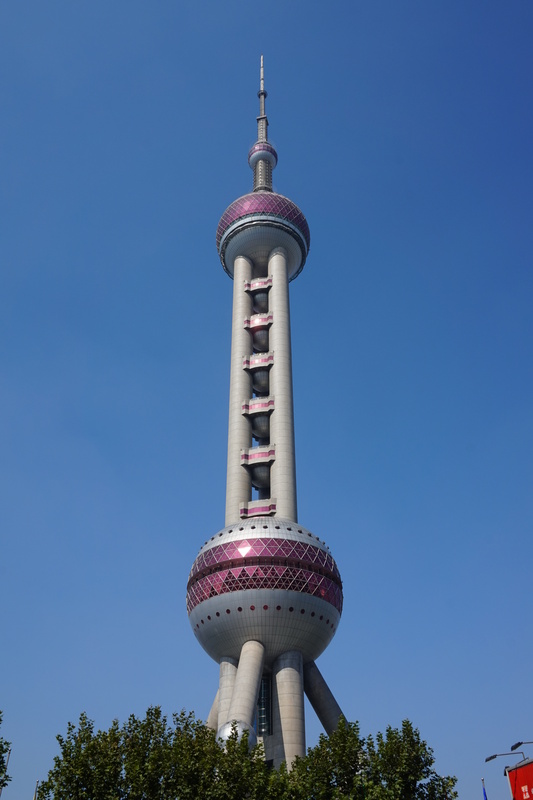 Standing here, you can take scenic photos of the skyscrapers at Pudong (浦东) across the Huangpu River. 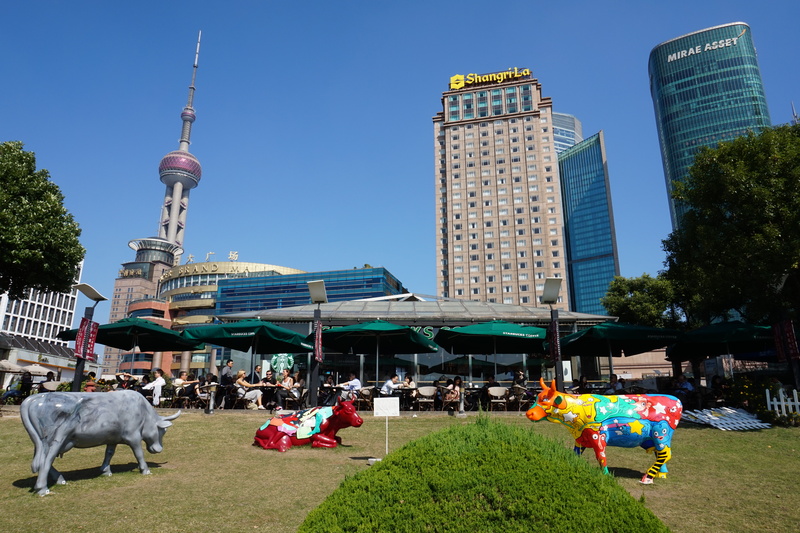 The iconic Shanghai World Financial Centre (上海金融中心) affectionately labelled as the bottle-opener, and the Oriental Pearl Tower (东方明珠塔) are two buildings that you cannot miss, the former being one of the tallest building in China. If you’re looking to find a special someone during your trip there, you can head over to People’s Square (人民广场) on a weekend and you’ll find hundreds of parents advertising their child at the nearby park. It’s almost like a bazaar, with their child’s CV/Resume exhibited. It was quite an eye-opener to see how important it is to marry off their precious child to someone of a worthy social status. 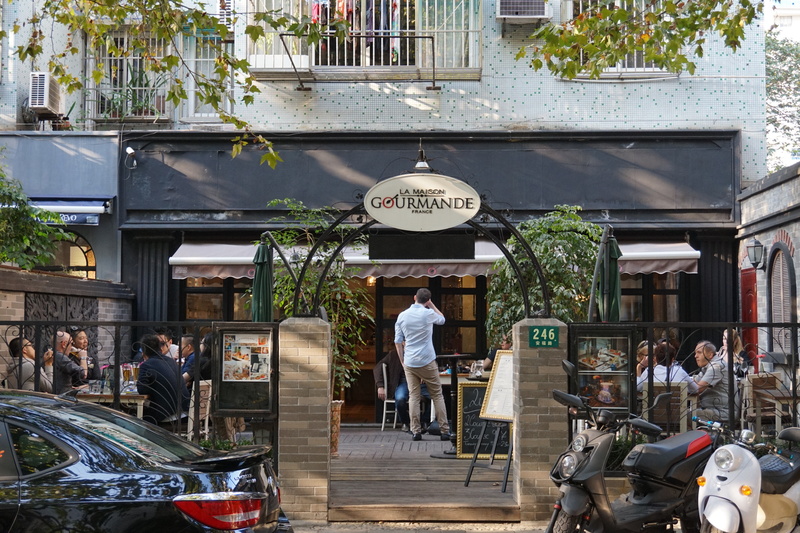 When you finally get hungry from all the walking, there is one restaurant that I’d like to recommend for affordable authentic food. I heard raving reviews from my friends (Singaporeans, as well as locals), so I don’t think it can go wrong. I visited the 外婆家 at IAPM, a shopping mall conveniently located on top of the South Shanxi (陕西南路站) Metro Station. 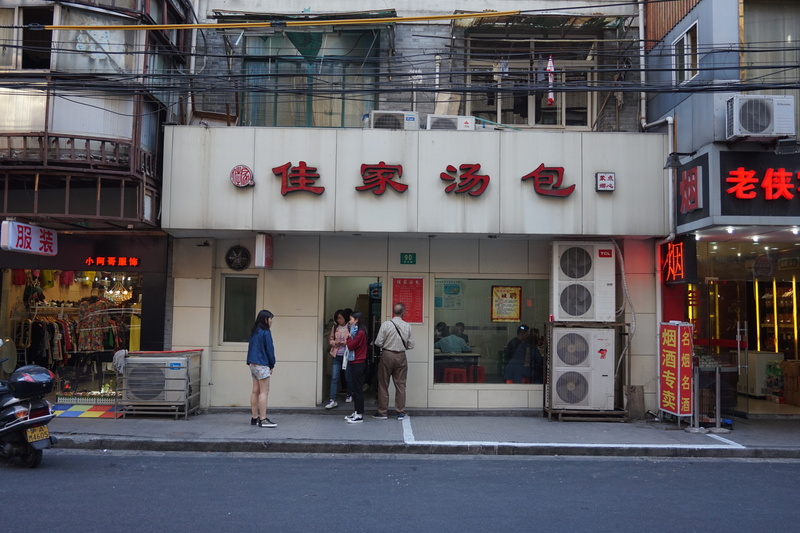 Also, who can forget about the famous 小杨生煎 and 佳家汤包 that are just opposite each other along 黄河路. 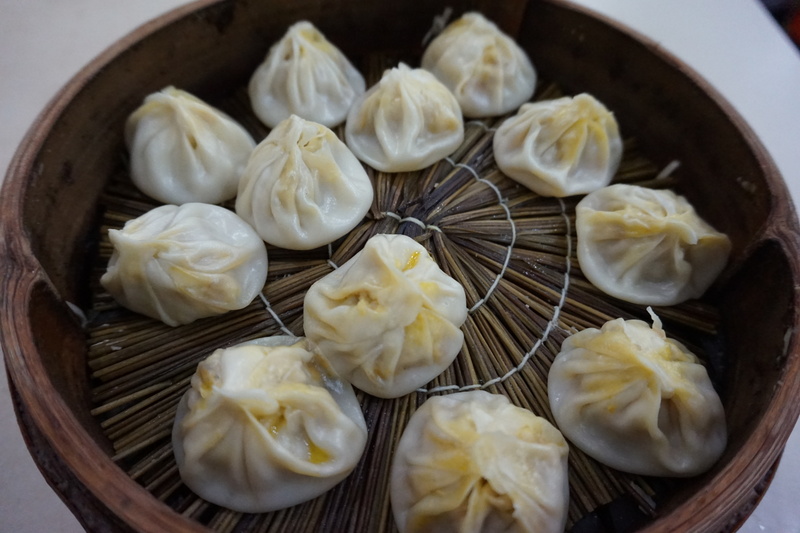 They’re almost the same thing (dumplings), except that one is fried, and the other is steamed. If you were to ask me to choose one, I’d vote for the steamed option. 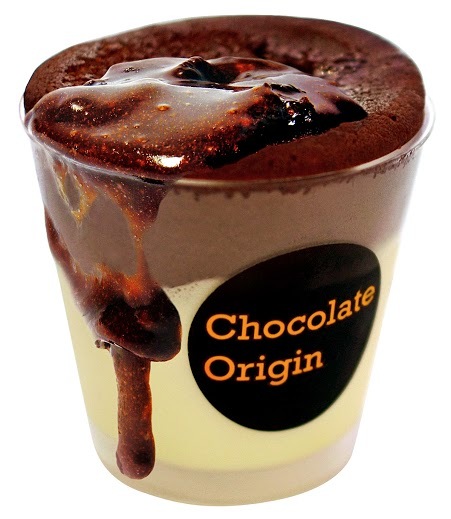 However, since you’re all the way there and they are really cheap, just order both to pamper your stomach. 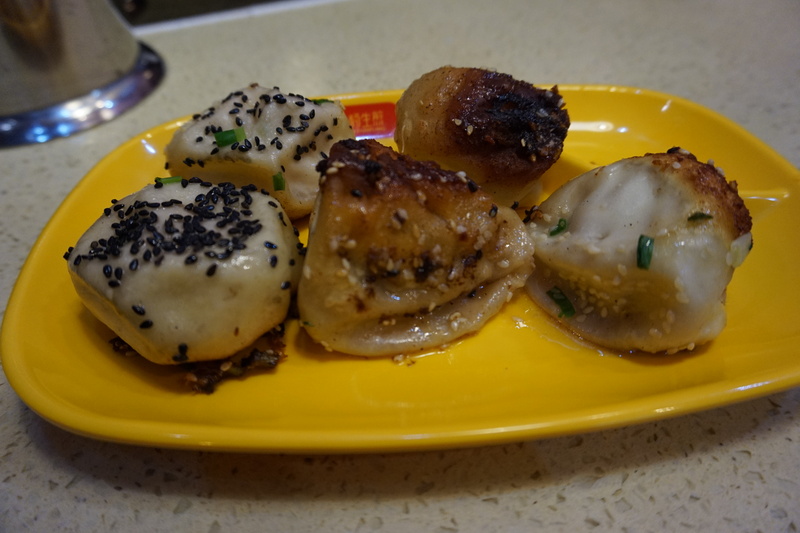 Kudos to 小杨生煎 for giving me an extra dumpling, probably because I appeared to be a foreigner while ordering. Eating 12 佳家汤包 (小笼包) for tea was not an easy feat, but it was so delicious I finished them all up by myself. Do go early to 佳家汤包 if not most items will be sold out by early afternoon. 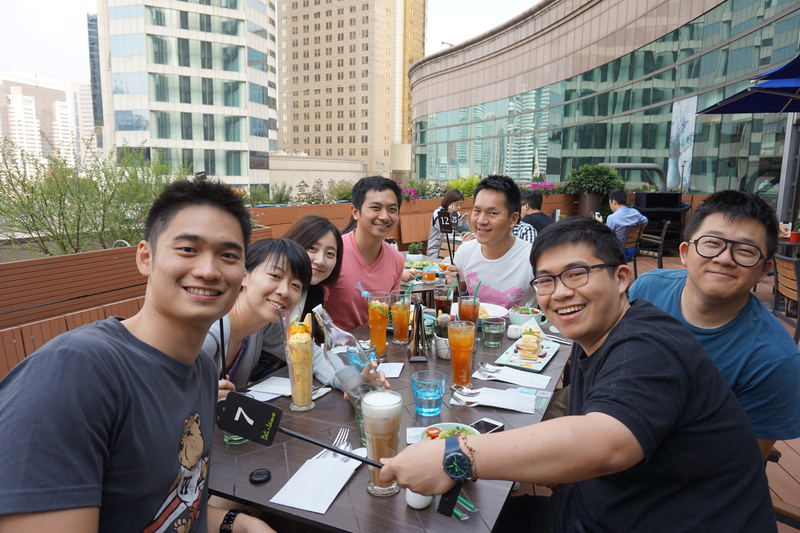 Finally, I have to thank my friends heaps for their hospitality during my stay in Shanghai! They gladly let me crash at their place and brought me around, introducing me to the special places there!! Group picture taken at an alfresco diner!